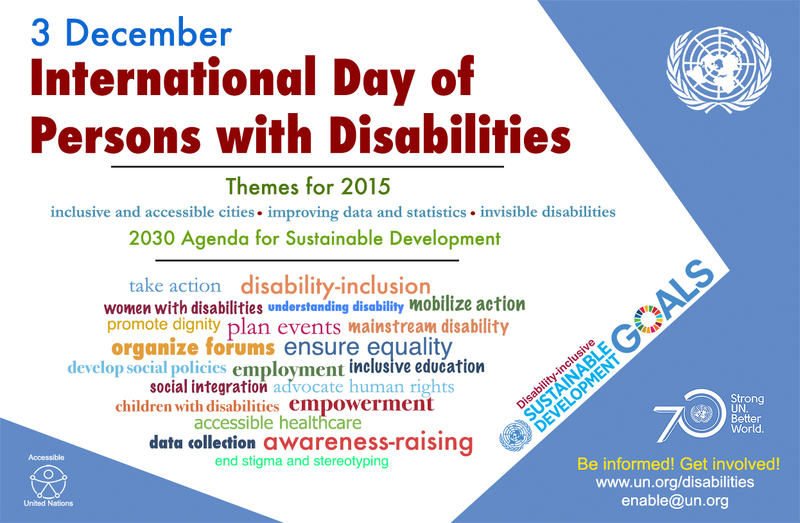 How do we make the 2030 Agenda for Sustainable Development disability-inclusive? I was lucky enough to be asked to chair a panel ‘Making the 2030 Agenda For Sustainable Development Disability-Inclusive’ at a conference entitled ‘Leave no one behind – Tackling inequalities of persons with disabilities in the 2030 Agenda for Sustainable Development’ on 3rd December in Brussels. The event coincided with the International Day of Persons with Disabilities (#ADay4All) in the framework of the European Year for Development. It was a chance for me to understand better the issues at stake for persons with disabilities in the Sustainable Development Goals and how we ensure that SDGs build on Millennium Goals and leave no one behind. The European conference on disability-inclusive development cooperation was organised by the European Commission in collaboration with the European Disability Forum (EDF), the International Disability and Development Consortium (IDDC), CONCORD Europe, CBM, Disabled People’s Organisations Denmark (DPOD), Handicap International and Light for the World. It gathered representatives from different EU institutions as well as from organisations of persons with disabilities in developing countries. The opening of the conference was made by EDF Executive Committee member, Yannis Yallouros. He reminded us what austerity means in practice: those who rely and need social services most like people with disabilities suffer most from cuts. The European Commissioner for International Cooperation and Development, Neven Mimica, participated in the opening of the conference with a video message in which he presented the EU position during the negotiations leading to the adoption of the 2030 Agenda and his strong commitment. The role of Parliament in the EU and the Global South was discussed. Richard Howitt, Co-Chair of the Disability Intergroup, Member of both the Foreign Affairs and the Human Rights Committees of the European Parliament – and a long standing advocate for the rights of persons with disabilities – called for more consolidated action in light of the UN Convention. Working in partnerships and ensuring the participation and empowerment of persons with disabilities in all aspects of the Agenda 2030 is crucial. The call to carefully review, apply and monitor the EU’s own obligations concerning accessibility was reinforced by the adoption of a proposal for a European Accessibility Act by the European Commission (EC) on December 2nd. All projects funded by the EU must be fully accessible for persons with disabilities. IDDC board member and CONCORD President Johannes Trimmel reminded us that we’ll make a difference in the SDGs if we promote real consultation: have we really done everything we can proactively to ensure those who need to be consulted have been? – I think it was the disability movement who coined the mantra we all now use ‘nothing about us without us’ –. Secondarily, he highlighted the importance of statistics and data to ensure real monitoring of results and success. Here, we in Europe and Eurostat could lead the way to ‘follow money’ (inclusive budgeting). Looking at how we spend the money we will know if disability issues are being taken into account in our international cooperation programmes. Klaus Rudischhauser, Deputy Director General of Directorate General of Development and Cooperation (DG DEVCO) told us about the EC plans to translate the commitments on the SDGs and in convention on rights of people with disabilities into practice. He invited us to come up with practical steps that he and his colleagues, including in delegations, could take. We agreed to come up with a plan or road map. a bit of a reality check from the African perspective. Political leaders often remained uninformed or even unreceptive to addressing accessibility issues in government policy and national development plans and budgets. Including Civil Society and DPOD in consultations with MPs and government representatives. He stressed the value and importance also of external pressure in making policy makers in Africa take notice of disability issues. A point underlined by Richard Howitt who observed that the UN monitoring EU commitment under Convention helped to push us into action. Finally the progression from a charity to a rights approach was a battle still very much being waged in many countries. For CONCORD the 2030 Agenda marks the beginning of a 15-year process of transformative change for people and planet. CONCORD would like to emphasize the important part civil society has played and will continue to play in making this vision of human rights and well-being for all within planetary boundaries a reality (Read here the CONCORD recommendations for EU and MS to support the CSOs roles).